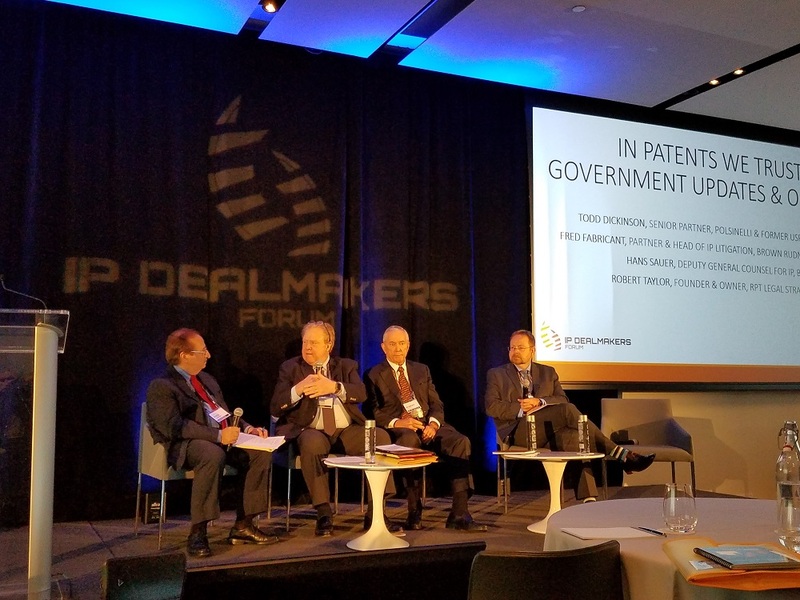 The annual IP Dealmakers forum took place on 7-8 November in New York. One panel was entitled, “In Patents We Trust: Government Updates & Outlook,” and was moderated by Fred Fabricant, partner and head of IP litigation at Brown Rudnick. Panellists were Todd Dickinson, senior partner, Polsinelli, and former director of the US Patent and Trademark Office, Hans Sauer, deputy general counsel for IP at BIO in Washington DC, and Robert Taylor, founder and owner of RPT Legal Strategies and a longtime patent litigator in Silicon Valley. Asked to talk about changes since USPTO Director Andrei Iancu took office last February, Dickinson noted that the 2011 America Invents Act (AIA), which reformed the US patent system, had only been administered by one administration, the 8 years under President Obama. So what happened during those years would not necessarily be what happened under the next administration, “and I think that’s turned out to be the case,” he said. A big piece of the director’s job is the policy direction of the office in conjunction with the rest of the administration, he said, and they have a “fair amount of leeway” on how the policy goes. He noted that the office just had its fee-setting authority renewed. In general, the office has a say in how things go. He commented on the range of actions being taken under the current USPTO Director Iancu, which have been “pretty significant.” That includes this week’s announcement of Silicon Valley attorney Laura Peter as the deputy director of the USPTO, new section 101 guidelines, new claim construction to conform to the so-called Phillips standard, and they published a set of rules for dealing with amendments, he said. There were a lot of complaints that the AIA was supposed to lead to a more flexible process for amendments, he said, and now the director has a proposed rule out for comments. He mentioned the question of how inter partes review institutions might change after the SAS decision [pdf], which led to a change to the institution regime. “SAS was a decision which kind of snuck up on people,” when the Supreme Court decided it, agreed the moderator, Fabricant, noting that at that time last year people were more focused on the Oil States case [pdf] to see if the PTAB process was constitutional. SAS said if even one PTAB decision was instituted then all claims were instituted by the PTAB – it has a dramatic impact, he said. Todd said the PTAB and the rest of the office “are not working quite hand in glove,” noting that the director has established a committee to coordinate this. Sauer said it has been interesting to see what AIA was intended to do and what it is doing. It is important because it is about deciding what is valid and what is not. But it is remarkable how little precedent have come out of that process from beginning all the way through, he said. There are not precedential decisions coming from the PTAB, and the new director understands that, he said. He said he thinks it will be an important step to create more precedent, including the procedure for doing so, which he said is going to be much improved, which will move from taking a vote of all PTAB members to the chief judge, the USPTO director and a few other officials are going to get together to decide. Todd said also that the director had previously delegate almost all of the authority to the chief judge and it was done in a way that left no way to appeal it, even if there was a problem with it. Taylor backed this up, mentioning an amicus brief he is working on for the SSL v Cisco case pointing to an article that allows recognition of whether the same patent is being considered again. In that case, the same patent has been considered three times by the patent office and was found valid by a judge, but then a PTAB panel – in a fourth time the patent had to “run the gauntlet – afterward found the patent was obvious. The case is now in the Supreme Court. On the appointment of the USPTO deputy director this week, Todd noted that by statute the director nominates the deputy who is appointed by the secretary of Commerce. He mentioned several scenarios for the chain of command. She could be parallel to the director in the organisational chart, as has been the case for the past 50 years, he said, and one model is the deputy runs the operations while the director leads on policy. Another model is to find someone who complements the director’s skill set, which he said may be the case here. On the proposed new guidelines for section 101 of the Patent Act, which covers subject matter patentability, Taylor said the 101 change is “significant.” If the patent office has clear guidelines [for more information see here] on what satisfies 101, it is going to make patents a lot more likely to comply with Federal Circuit guidelines, he said. When you look at the Bilski [pdf], Alice [pdf] and Mayo [pdf] cases, he said, the Supreme Court left some room for the Federal Circuit to find inventions patent-eligible. The Federal Circuit seems to have over-reacted to that and now seem to be carving back on that, he argued. But the process has to start with the patent office, he said. Sauer said the biotech industry is deeply affected by 101 and watch closely what the patent office and the courts are doing. When the director said he would make changes – “not to put a wet blanket on it,” he said – the patent office can only do so much because it is bound by the courts. So it will have to produce the same outcomes that the courts have decided. “And it’s really those outcomes that we have been complaining about in biotech,” he said. It is a help to have the patent office look forward on 101 and propose a change, he said. The guidance may have a “persuasive value” for the courts, but there are district court judges who don’t care on way or the other how the patent office examines claims, he noted. Todd asked if the USPTO could also make changes, to perhaps test the courts, to which Sauer said yes, they are doing that. He said he thinks the patent office is “quite open” to test cases that are being “teed up” together with applicants. BIO discussed with its members and they said no, as soon as walk into oral argument and see the panel for a 101 case they predict the outcome in probably 75 percent of cases. “We’ve had companies saying, ‘We’d like to do test case, but on the other hand, we might just end up making things worse,’” because they trust the Federal Circuit almost as much as they trust the Supreme Court on section 101. Taylor agreed that ultimately this has to be fixed by Congress, there are cases particularly in the biotech space that are making it “very risky” for people to spend a lot of resources developing diagnostic procedures. But, he said, the USPTO has some things it can do. “They are one of the agencies that can speak knowledgeably to the patent system, and to Congress, and they should exercise that,” he said. And he questioned whether the USPTO could possibly file an amicus brief of its own in cases. Todd said there is a way through which they can file on a substantive point. On another issue, the moderator question on how estoppel might be addressed in the courts. Todd said everyone thought with the AIA there would be hard estoppel, but they are seeing that is not what it means in the courts. Taylor mentioned an article by Phil Johnson of Johnson & Johnson (who was involved in the drafting of the AIA) which compared what was intended in the drafting of the AIA, and what actually took place once it was completed. For example, the patent office has allowed the same challenger to file multiple petitions all at the same time, with the theory that that there would not be any estoppel. “That practice is directly contrary to what was said over and over again during the legislative process,” he said. "Experts Assess Coming Changes In US Courts And Patentability" by Intellectual Property Watch is licensed under a Creative Commons Attribution-NonCommercial-ShareAlike 4.0 International License.